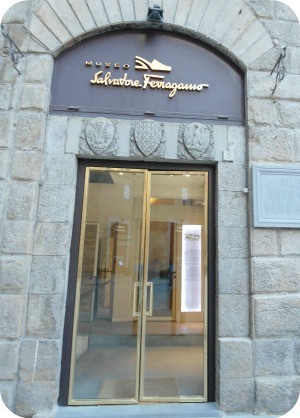 The Ferragamo museum is a must for anybody visiting Florence who is interested in fashion. Salvatore Ferragamo made his name by producing some of the most innovative and striking footwear of the twentieth century. This museum is a tribute to the man and to the glamorous fashion empire he was able to create. The museum is also an homage to Ferragamo as one of the pioneers of the ‘Made in Italy’ label, words which today are associated with first-rate quality and outstanding stylishness. 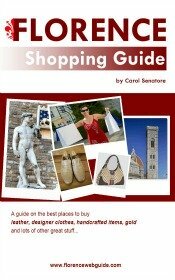 The Ferragamo museum is located in the romantic Spini Feroni building, a medieval palace built in Florence in 1289. The displays take you through Ferragamo’s career, from his first footwear creations and patents up to his last designs made at the age of 62 in 1960, the year of his death. The collection has over 10,000 pairs of shoes which are shown on a rotation basis, changing every 2 years. At the museum you learn how Ferragamo was able to combine innovative ideas and novel production techniques while still producing aesthetically striking shoes. At the Ferragamo museum you also find out that Ferragamo was the inventor of two shoe styles that today are considered commonplace: the platform shoe and the cork wedge heel. 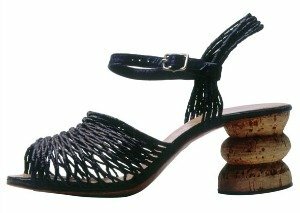 Although platforms and wedges are considered normal today - even conservative - these were innovative designs when Ferragamo came up with them in his search for more comfortable shoe styles. Apart from shoes, the Ferragamo museum has plenty of other documents on display such as orders for shoes placed by Marilyn Monroe or Greta Garbo and applications for patents filed by Ferragamo between 1929 and 1960. The fact that the man was still inventing and patenting ideas even up to 1960, the year of his death, really illustrates how his creative juices never stopped flowing in spite of the enormous success that he had already achieved worldwide. You can also see fun stuff like the company’s first advertising campaigns and posters which are great vintage items. One of the most informative and enlightening parts of the museum is a video spanning the life of Ferragamo with original footage from the turn of the century to today. This really gives you a bird’s eye view into the life of this great Italian entrepreneur. Another fun exhibit at the Ferragamo museum is a step-by-step display showing how to go about making hand-made shoes. If you’ve never seen shoes made by hand before, it’s an eye-opener to see the process from start to finish. You see each stage in the shoe making process all laid out on a table, from the first cutting of the shape, to creating the foundation, to stitching the leather, and so on until all the bits and pieces turn into a recognizable shoe. 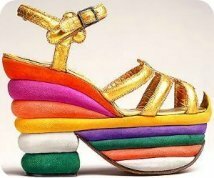 Ferragamo’s success was in large part due to his painstaking search for what he called ‘the perfect fit’ which could combine beauty and comfort. The museum fills us in on Ferragamo’s quest for this ‘perfect fit’. 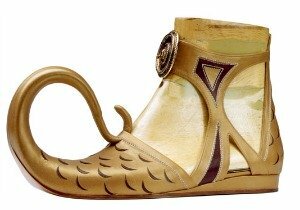 It bothered Ferragamo that his clients would complain that his shoes were gorgeous and elegant yet were hard on the feet. A perfectionist, he decided to study the anatomy of the human foot to resolve this problem. 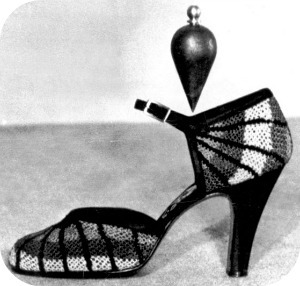 Through his studies he realized that it was the arch of the foot that had the hardest job: that was where most of the weight of the body ended up when standing and walking (Ferragamo illustrated his concept by using a pendulum, see pic above). 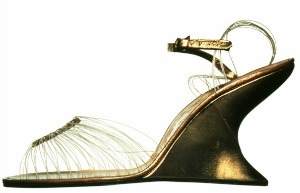 Ferragamo invented a new type of sole, with a thin steel plate support system. This – one of his countless patents which you can see in the museum – was to be one of the foundations of Ferragamo’s winning shoe production, as the steel reinforcement made the shoes lighter yet sturdier and more comfortable. Salvatore Ferragamo, from everything you see at the Ferragamo museum, seems to have been destined to become a master shoe-maker from birth (Ferragamo himself preferred to be called a ‘shoe-maker’ rather than something more elitist such as a ‘designer’ or ‘artist’). Born in 1898 in a town near Naples in the south of Italy, he was the 11th out of 14 children. He found his vocation early, making his first pair of shoes at the age of 9 for his sister. He then started working as an apprentice at the age of 11. 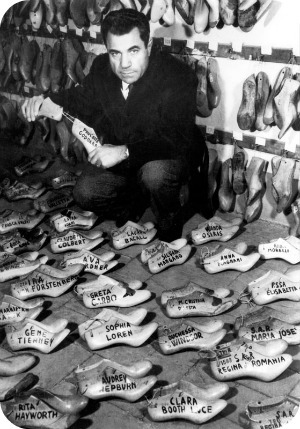 Later, yet still a boy in love with shoes, he emigrated to the U.S. and worked in a boot factory. This was the beginning of the twentieth century with industrial production replacing hand-labor, but Ferragamo wasn’t satisfied with this type of shoe manufacturing. He felt that the individual touch was missing and that the mechanics of fast production led to inferior quality. 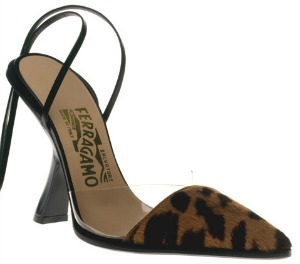 Ferragamo eventually moved to California and opened up his own shop for made-to-measure shoes. As business grew he wanted to expand, but there was one problem…he could not find skilled craftsmen and artisans in America. His ambition and search for able artisans led him back to Italy and to Florence, a city already known for its highly skilled craftspeople. He opened up his shop in Florence in 1927. At the Ferragamo museum you also learn about Ferragamo’s relationship with Hollywood and the glamorous stars of the 40’s and 50’s. 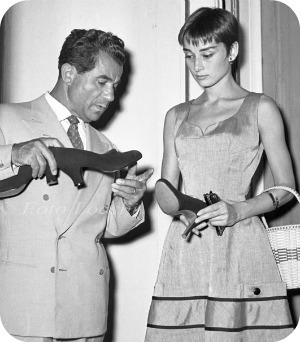 It started out as a simple work commission: film directors would hire Ferragamo to make the footwear for his actors’ costumes. The actors though, who wore the shoes for work, were so impressed by their comfort and style that they started ordering shoes for their personal use. 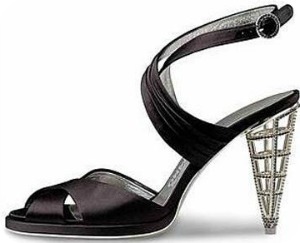 Ferragamo became known as the ‘Shoe-maker to the Stars’. At the museum you can see shoe models that Ferragamo created for Marilyn Monroe, Audrey Hepburn Anna Magnani, Judy Garland, Eva Peron, Greta Garbo and others. You also get to see some modern designs such as a shoe made for Madonna for the film ‘Evita’ and for Nicole Kidman for the movie ‘Australia’. Another interesting aspect of the Ferragamo museum is the exhibits that the museum organizes periodically. Exhibits are set up, for example, to focus on and give a more detailed view of one particular aspect of Ferragamo's work, such as the use of color or certain materials. Other exhibits pay homage to Ferragamo’s work with the glamorous world of Hollywood. In the past the museum has had expositions on Greta Garbo, and Audrey Hepburn and more recently on Marilyn Monroe. See the official museum site below for more on exhibits. If you like fashion or just beautiful things, you'll definitely love this museum. The Ferragamo museum displays shoes as Salvatore Ferragamo himself saw them and created them: not just as necessary accessories, but as objects of art. You can't help but be impressed by this one man's passion for making shoes, the creativity that he brought to it, and the heights that he was able to reach. The museum takes about an hour and a half to visit without rushing. photos on this page from the Ferragamo museum official site.